Owners of H&R Complete have been Servicing Spokane and the Inland Northwest, Providing Septic Tank Pumping, Excavation and Septic System Installation Since 1984! Family owned and operated, local Spokane Septic Pumping and Excavating company since 2003. 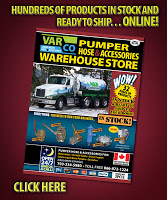 Our Septic Pump truck has been the main public advertising for H & R Complete. A bill board on 6 wheels to say the least. Being built from the ground up,with top of the line materials, it holds true to our motto of “Helping to maintain a safe and sound environment”. If you have seen it, then you will remember the beauty of the Inland Northwest depicted on the mural that surrounds our truck.The beauty that we promise to keep true by treating every job as though it was our own back yard. It is this truck and many more that just show the quality that H & R Complete is known for! Featured “Classy truck of the Month, March 2012”! “Owners and operators Herb and Rob Dollar purchased a 2002 International tractor with a Caterpillar C-12 engine and 18-speed transmission and took it to T2 Services Inc. in nearby Spokane, Wash., for a build out. It was outfitted with a drop axle and 3,300-gallon steel tank with vacuum provided by a Masport HXL 400 pump. It has two topside manways and 36-inch rear manway, 3-inch suction and 4-inch discharge valves and heated valves. It has strobe lights front and rear, chrome horns, dual 6-inch chrome exhaust stacks and aluminum wheels all the way around. It also has a tool box between the cab and tank. Mountain- and woodland-themed graphics were designed by Sam Dollar and executed by Van Design. The pumping truck is used for residential and commercial septic and grease trap pumping”. Septic: Septic Tank Installation/Pumping, Septic Tank Cleaning, Septic Service Sewer Repairs, Complete Sewer System Installations, Drain Field Installation, Grease Trap Services, and Excavation projects. Residential & Commercial.Operation & Maintenance Specialists, only O & M Providers servicing Spokane and the Inland Northwest. Excavation: Excavation for Utilities, Excavating Basements, Test Holes and Driveways. When it comes to moving dirt our Excavation specialists and top of the line excavation equipment will get the job done. Excavating Spokane. Specializing in the latest Waste Water Disposal & Pumping Systems for New Home Installation, Drain Field Replacements/Repairs, Test Holes, Line Service Repair & Cleaning,Septic Tank Pumping, Sewer System Engineering & Design, Sewer Connections, Sewage & Effluent Pump Service & Sales. Septic Spokane, Septic Spokane Valley. Contractor REG. # HRCOMI*972DD Licensed, Bonded and Insured!